* Weekly Honor: Soccer America Team of the Week (10/18/12). 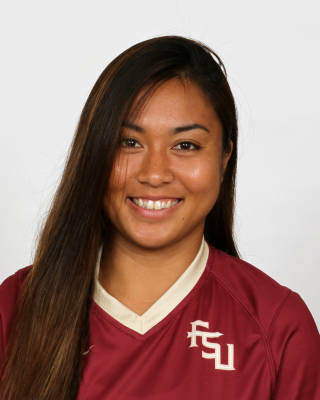 * Appeared in 23 matches making four starts for the Seminoles during her junior season. * Tallied over 700 minutes on the pitch playing a season-high 65 minutes against NC State. * Earned starts against Oregon State, Oklahoma, NC State and Miami…the start against the Beavers came in the season opener. * Finished the season with six shots with three going on frame closing out the 2013 season with a .500 shots on goal percentage. * Recorded shots on goal against Auburn, NC State and South Alabama. * Played in four of FSU’s six NCAA Tournament matches recording double-digit minutes in three of those matches including South Alabama, Colorado and Boston College. * Made 23 appearances during her sophomore campaign with three starts…first career start came on the road at Miami playing all 90 minutes. * Finished the season with two points all coming on her first career goal. * Found the back of the net in the 27th minute scoring the only goal – her first career game-winner – in a 1-0 victory over Virginia Tech…finished the match against the Hokies with two shots as both were fired on goal. * Made an outstanding play to win possession of the ball in the first overtime period against Virginia which led to a penalty kick opportunity for FSU. * Registered a career-high three shots twice in games against Jackson State and in the first round of the NCAA Tournament against Mississippi Valley State. * Finished the season with a career-high 13 shots as eight went on goal. * Closed out the season recording double-digit minutes in the last 15 games…tallied a career-high 104 minutes on the pitch in FSU’s second round NCAA Tournament match-up against Texas Tech. * Collected back-to-back starts for the first time in her career in the NCAA Tournament starting against Mississippi Valley State and Texas Tech in the first two rounds…played over 260 minutes in the postseason tournament…saw action against Penn State in the national semifinal in San Diego. * Appeared in 20 games during her first year at Florida State. * Tallied two points on the year with both coming on assists…assisted on goals in back-to-back ACC games against NC State and Virginia. * Assisted on the eventual game-winning goal finding Ines Jaurena in the first half of a 2-0 victory over NC State…marked her first career collegiate point and assist. * Found Tiffany McCarty for a goal in the waning minutes of the first half to tie the match going into the locker room at Virginia. * Registered her first career shot on the road at Portland…tallied seven shots on the year with one going on goal at Clemson. * Played a season-high 46 minutes against North Florida…tallied over 20 minutes a contest eight times in 2011. * Saw action in both the ACC Tournament semifinal match against Virginia and the championship game against Wake Forest. * Came up big for the Seminoles in the ACC Championship game against Wake Forest…led the team off in the penalty kick shootout converting on FSU’s first attempt en route to claiming their first league title. * Appeared in four NCAA Tournament matches including the national semifinal game against Stanford at KSU Stadium in Kennesaw, Ga.
* Member of the JFA Fukushima. * Participated in the JFA National Tournament, representing all age, for three years from 2008-10. * Daughter of Toshio and Aiko Murakami.